Apple has now launched iOS 8, a major revision to the leading mobile software platform for iPhone, iPod, and iPad. While it may not be complete just yet, it will be the biggest change since the introduction of the AppStore in 2008. Some of the leading additions including Continuity, iCloud Drive, and Health are coming in the near future. The first two require OS X Yosemite to function on a Mac, which will be released at the end of October. There is still plenty to be excited about with iOS 8. Here is the full list of all new highlighted features. If you have not updated yet, find out how to update hassle-free. The Photos app received a few key updates, including a search option and advanced editing tools. Users can now adjust specific light and colour levels and crop images with a precision dial. The filters are still there from before alongside Auto Enhance. Another new feature in the editor is the ability to import tools from a third party app. The button at the bottom with a circle and three dots inside brings up a menu to toggle external editing tools. I was able to test this out using Litely since they updated their app earlier today to take advantage of this functionality. More apps will include this feature over time as they are updated. 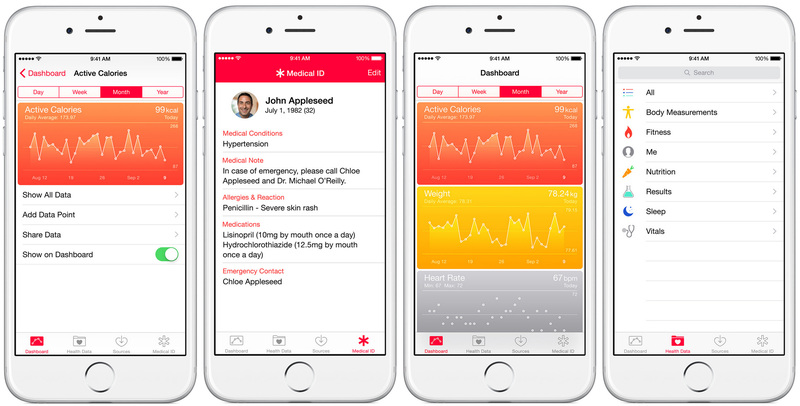 Apple has taken a large initiative in health with iOS 8 and new devices such as the Apple Watch. Being active and monitoring your progress has been made easier than ever with the Health app on iOS 8. Users with an iPhone 5s or 6 can take advantage of the M co-processor that monitors movement and translates it into data for the app to display. Custom goals can be set up with nutrition and fitness. Those who may be at risk for emergency situations can create a custom card that displays personal information including medical conditions, allergies, current prescriptions, and who to contact. The Health app is not currently available on iPad. Messages has been overhauled to include many features found within other third party apps. Enhancements such as voice and video messages have been integrated into the text bar. 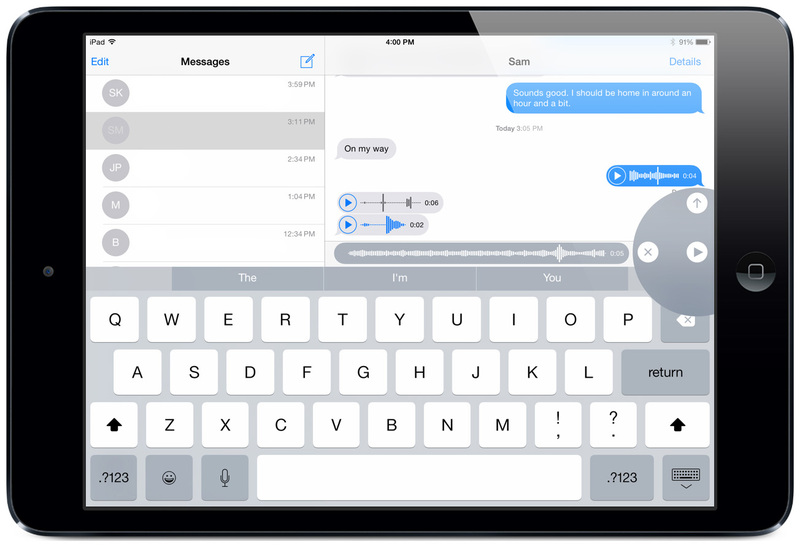 If the bar is empty, a microphone will appear where Send would normally be allowing users to record small audio clips. A waveform will appear in the text bar while holding the button. It picks up audio from the microphone until you let it go. You can then tap either the X to discard the recording or the up arrow to send it. These clips will automatically delete after 2 minutes to conserve storage but can be kept forever by selecting the keep option below the message. Another new feature is found inside the camera button. Tapping it would normally bring up the option to insert an image, but now displays a quick access of all your recent images. This is extremely beneficial as inserting an image previously took much longer and required a few extra unnecessary steps. Quick reply has been integrated into most notifications by pulling down on the banner. Actions such as reply, or responses for various apps can be selected in this menu. Group conversations also received new additions. Each message thread has a Details section in the top right corner that brings up a separate menu. Users can add or remove participants, share their location, silence alerts from the entire thread, and view all attachments that have been sent or received. This is one of my favourite enhancements for iOS 8 and I look forward to having more group conversations. 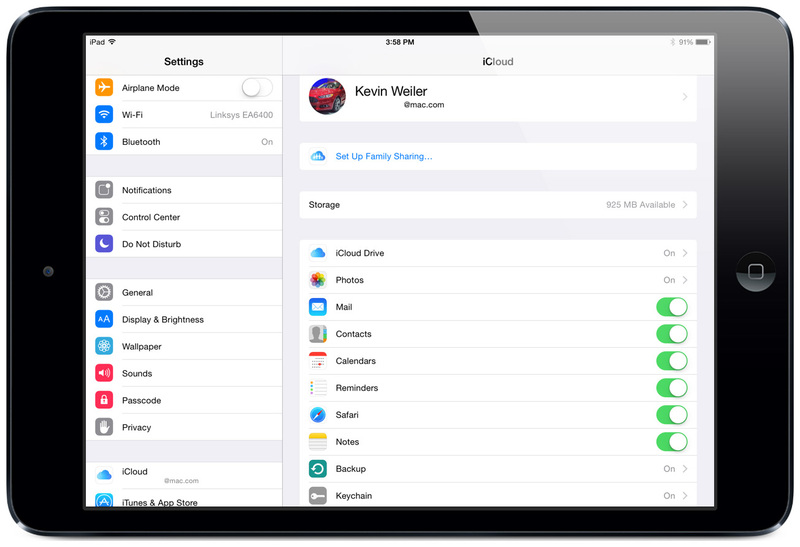 A few new additions were added to iCloud, including Family Sharing and iCloud Drive. Family Sharing allows a user to group with up to 5 others and share purchased music, apps, books, and videos from all accounts. The primary account will have a credit card on file that users can make purchases with after receiving authorization. A notification will be sent to the primary account any time a purchase is requested. Additional features include shared locations and photo albums between family members. Be cautious as each user can only change their family group twice a year. iCloud Drive enables the use of iCloud as raw storage. New pricing tiers were implemented last week starting at 20GB for $0.99 per month. This aligns the service with other major cloud offerings such as OneDrive, Dropbox, and Google Drive. Apps can store files in their own dedicated folder within your iCloud account and can be retrieved on a desktop computer or another iOS device. It will not be fully implemented until OS X Yosemite is released next month and apps are updated to support it. Widgets have been a long requested feature. Android users have been using widgets on their home screen for a few years and Apple has finally responded. 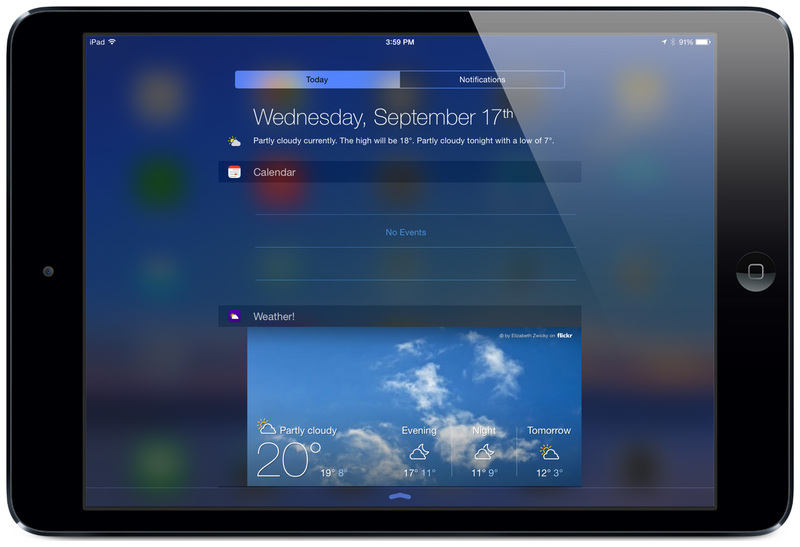 Apps now have the ability to add functionality into the Notification Center with a dynamic widget. Developers will be adding this into their apps over time, but a few including Yahoo Weather have already been updated. One of my most anticipated widgets is from Philips Hue to enable quick scene access within the Notification Center. In addition to the main points above, there are many more changes under the hood. Here are the rest of the updates. Continuity – Features such as phone calls and SMS messaging can now be viewed and replied to on iPad and Mac. Instant Hotspot connects a Mac to an iPhone within range with no additional configuration. Hand-Off – This feature allows activity on one device to be continued on another. Will be fully implemented when OS X Yosemite is released. 3rd Party Keyboards – New keyboards can be downloaded from the AppStore to provide enhanced functionality. SwiftKey, Fleksy, and Swype are the leading examples and can be installed now. Predictive typing has been implemented into the stock keyboard with QuickType. It will learn your patterns and offer suggestions based on the content in your message. Simply tap the word to insert it. Mail has been updated to include additional options when messages are swiped to the left. Contact shortcuts have been added at the top of the Multitasking menu. Select a name from the menu to send a message or call. The Appstore received numerous changes including a new vertical layout, trending search results, and Bundled App packages. Siri has song recognition, new language support, and the ability to purchase content. “Hey, Siri!” can be activated to use Siri hands-free while the device is charging. Spotlight now searches Wikipedia, iTunes, news, suggested sites, and movie showtimes. 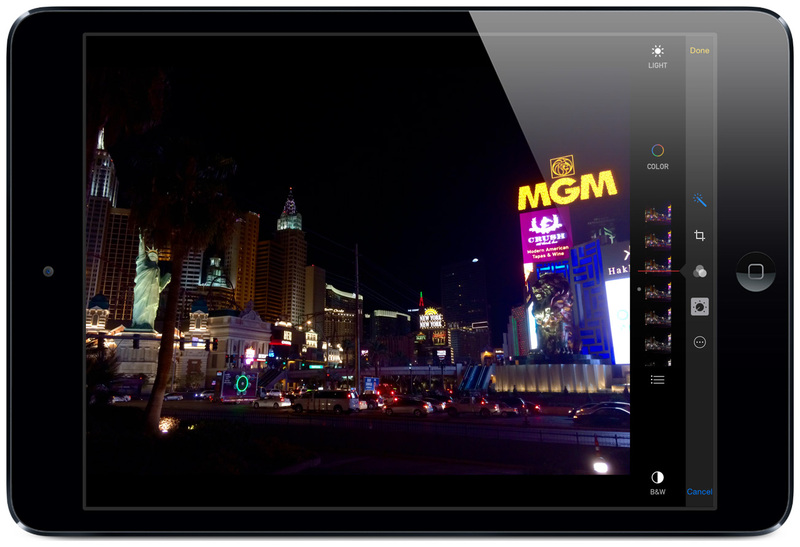 Camera app now has Panorama for iPad, and a Time Lapse mode for most devices. Battery Usage for each app can be viewed under Settings > General > Usage. New Accessibility options including a Greyscale mode. While there are many more internal changes, the ones listed above are the highlighted features. For the entire list of new additions and enhancements, visit the Wikipedia entry for iOS 8. This is by far the biggest iOS release to date, and will continue to improve once OS X Yosemite is available.